STEVE DWELLEY, raised in Santa Barbara, began training in Buddhist meditation in 1988. His first trip to India and Nepal in 1990 awakened a desire to involve the moving body in the meditation process, and he began practicing asana. Important teachers: Erich Schiffmann opened the door to the depths of asana practice, Chuck Miller opened the door to Mysore, where Steve finally made the study-trip in 1994. Although he accepted Pattabhi Jois as his teacher, it was Sharath who taught Steve much of the tangible material of the practice while in India. For those years in Luxshimpuram, Sharath was a model of kind strength. MICHELE NICHOLS: A fifth generation Californian, Michele was hired by the Berlin Ballet at age 19 and continued to dance professionally full time until she was 27, primarily in Europe, both ballet and modern. She participated in many exciting and ground-breaking performances during this time. Michele began to practice yoga in 1991 as a means of caring for her body, exploring different forms of practice including Bikram, Iyengar and Ashtanga inspired flow. When a friend introduced her to the traditional form of Ashtanga in the spring of 1997 there was no turning back, she had found her practice, her practice had found her. 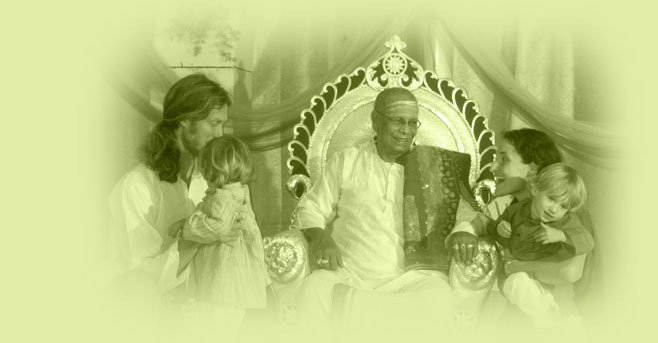 The following year India beckoned and she traveled to meet Pattabhi Jois for the first time. Later that same year, she learned the sitting practice of Vipassana meditation, which has deeply informed her asana practice, her teaching, and her daily life. In January 1999 Michele joined Steve in Santa Barbara to assist in the Ashtanga Program he had begun the year before. Through the years she has been deeply inspired by the strength and generosity of her teacher and friend, Dena Kingsberg, the commitment of "Guruji" and his family, and the deep heart of her husband, Steve. She is forever grateful to all of her teachers in all of their forms. Steve and Michele met in Mysore, India in January of 1998 while studying at the Ashtanga Yoga Research Institute. The following year, as fate would have it, Michele joined Steve at the Santa Barbara Yoga Center (SBYC). In the fall of 2001 they opened the Ashtanga Yoga Shala, a dedicated Mysore-Style practice space. Two years later they gave birth to twin sons, Arran and Ethan. At this point Michele took a two year hiatus from regular teaching. After seven good years, the building in which they conducted the Shala was purchased by a developer, and they moved the daily practice back to SBYC on October 2008. In September 2013, they were delighted to finally open their own Shala again, Ashtanga Yoga Shala Santa Barbara, at 1213 State Street Suite J. You can find them there now.